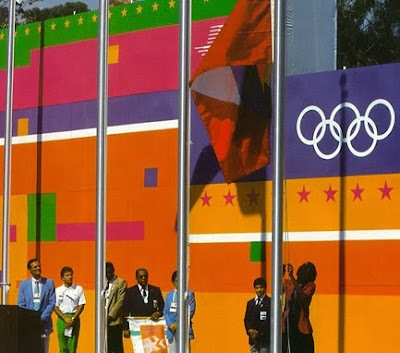 Last month - Wednesday, September 13th - the International Olympic Organizing Committee officially awarded the 2024 and 2028 Summer Olympics simultaneously. Both Paris and Los Angeles have both hosted the Summer Olympics twice before. Paris in 1900 and 1924, and Los Angeles in 1932 and 1984. 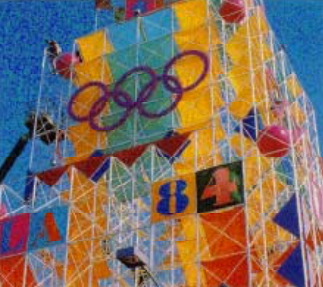 Above, a poster from the 1984 Los Angeles Summer Olympics. 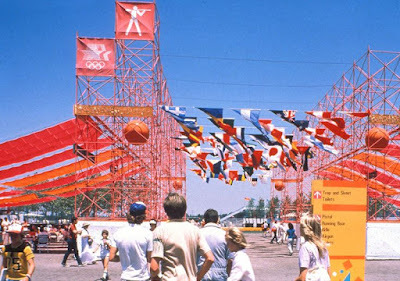 Last month, I reposted a couple of previous posts on the 1984 Summer Olympics: Los Angeles' Moment: the 1984 Summer Olympics and "Festive Federalism" 1984 Los Angeles Summer Olympics. Looking for photos from the 1984 Olympics, I came across library.la84.org, with numerous images I had never seen before. Most of the images on this final post are from that site. 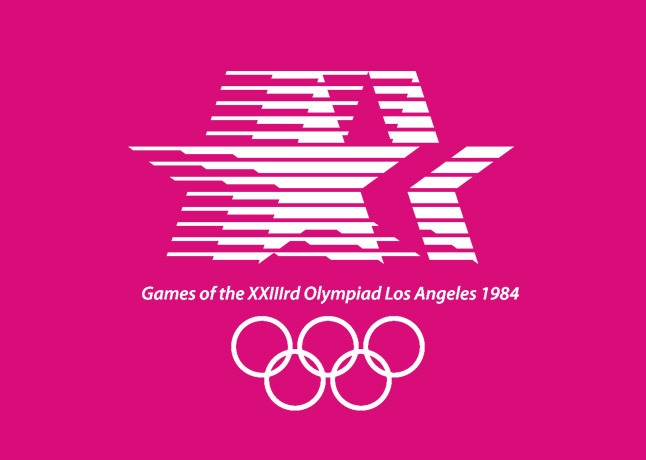 If the Los Angeles Olympic Organizing Committee sticks with "what worked" in 1984, the 2028 Summer Olympics should be an outstanding success. Above, the entrance to the Track and Field events at the historic Memorial Colosseum. It was fun finding photos from the 1984 Summer Olympics - often without a caption or description of location. So in many cases, I'm taking an educated guess at the venue or location. Feel free to make or suggest any corrections in the comment section below. A clock tower at the Olympic Village at USC. Most of everything was very temporary. While other cities have spent millions (or billions) on costly infrastructure, Los Angeles actually turned a profit of $215 million - $520 million in today's dollars. 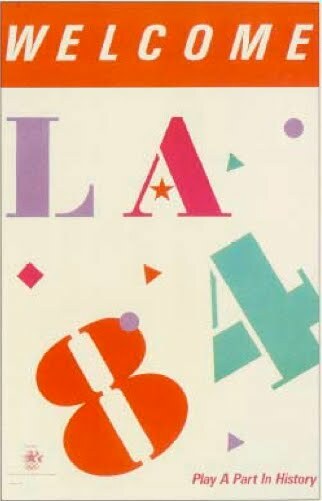 I believe L.A. was the only city to have every do so. 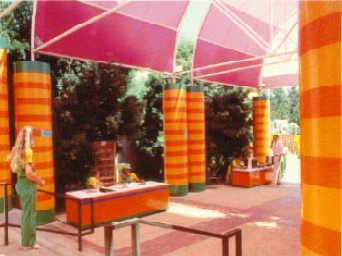 And bright, bright colors. Colored sono tubes, scaffolding, and fabric banners. 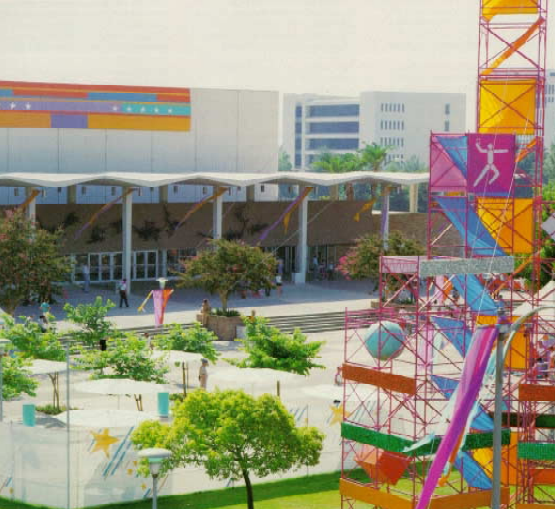 Above, outside the wrestling venue at the Anaheim Convention Center in Orange County. 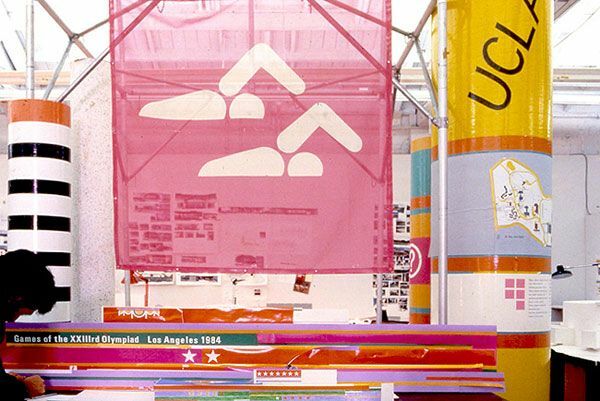 The "Los Angeles Olympics" could have almost been called the "Southern California Olympics." 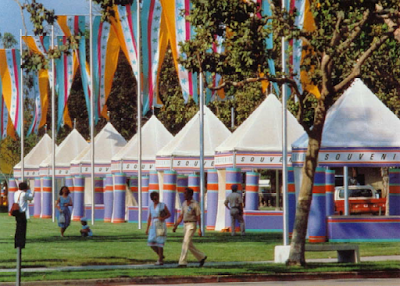 While most were centered in Los Angeles, the venues stretched almost 200 miles. Canoeing and Rowing events were held at Lake Casitas in Ventura County - 85 miles west of Los Angeles. 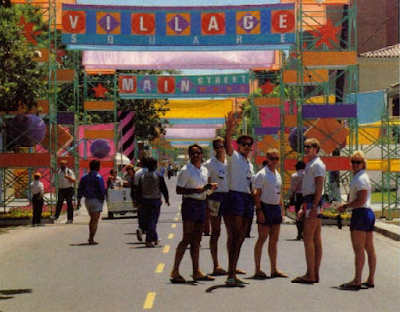 Equestrian was held in Rancho Santa Fe in San Diego County - 107 miles of Los Angeles. 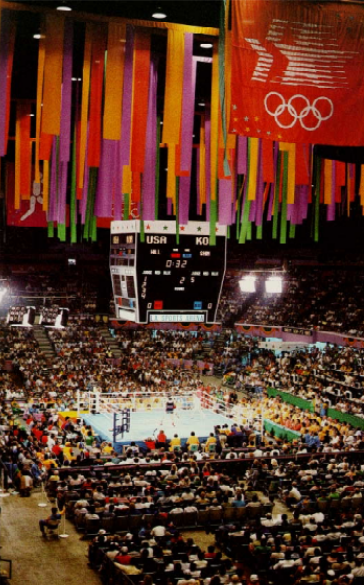 My guess is boxing, the US vs South Korea, at the Sports Arena, adjacent to USC. 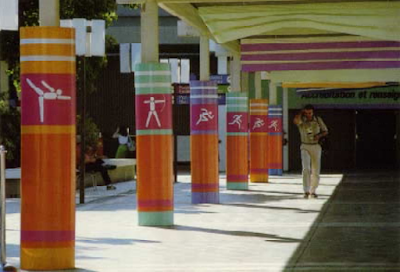 Guessing from the graphic on the scafolding on the right, this is the handball venue, held at California State University, Fullerton - also in Orange County. 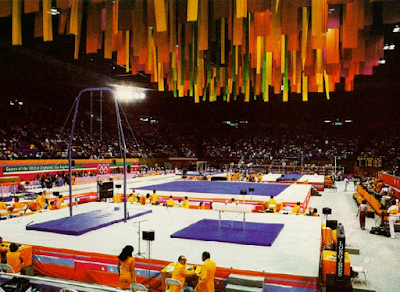 Looks like the gymnastics venue - Pauley Pavilion, UCLA in Los Angeles. Your guess is as good as mine. 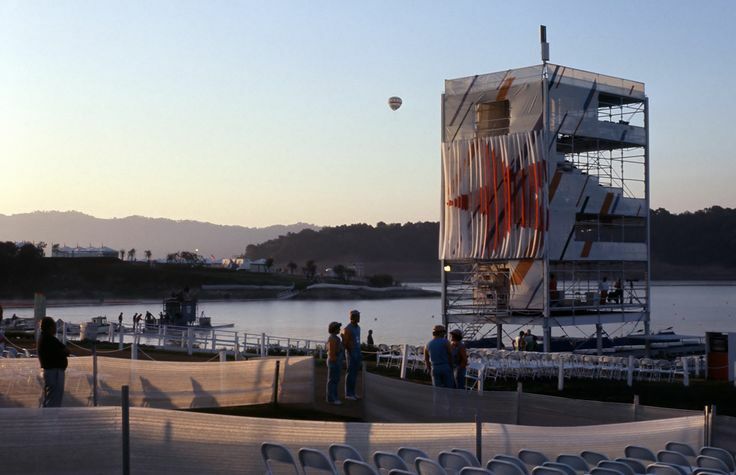 My guess is the rowing / canoeing venue up at Lake Casitas in Ventura County. Looks like the boxing venue at Sports Arena. The sport Arena was torn down in 2016 and is currently being replaced by the Banc of California Major League Soccer Stadium. 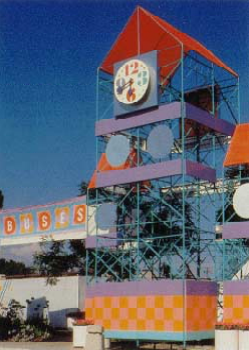 Plans call for this new stadium to serve as a venue for the 2028 Games. 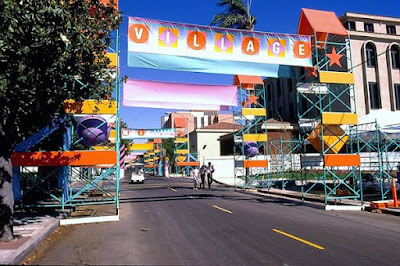 Olympic Village, University of Southern California. Not sure on this one: either the swimming venue next to USC. But on the right there's a map of UCLA. Which one is it? 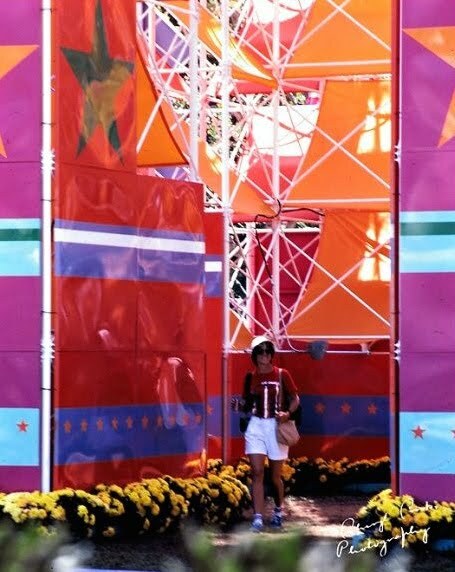 A personal photo from someone fortunate enjoy to have enjoyed the various events. 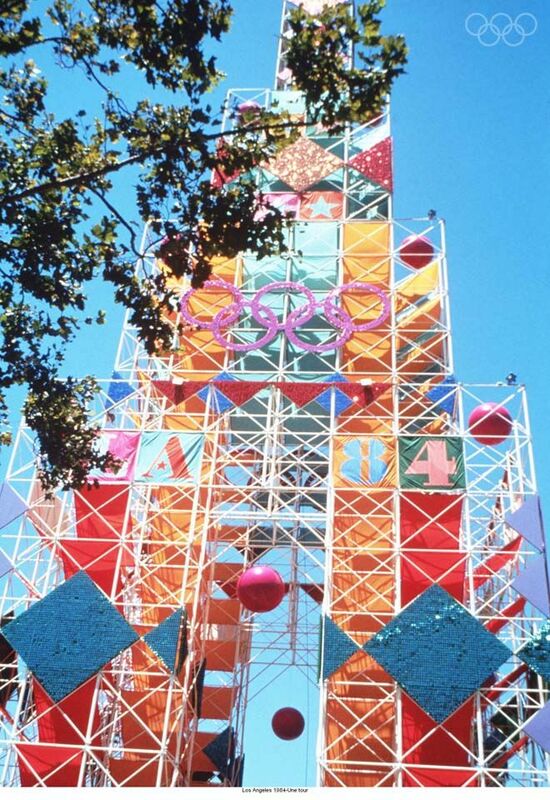 My kids, still teenagers now, will be 28 and 26 when Los Angeles hosts the Olympics for a third time. They think it's great - and are super excited about attending some of the events. Looks like the shooting venue at Prado Recreational Area - 48 miles west of Los Angeles in Chino. Tickets to events like this were, of course, very reasonable. 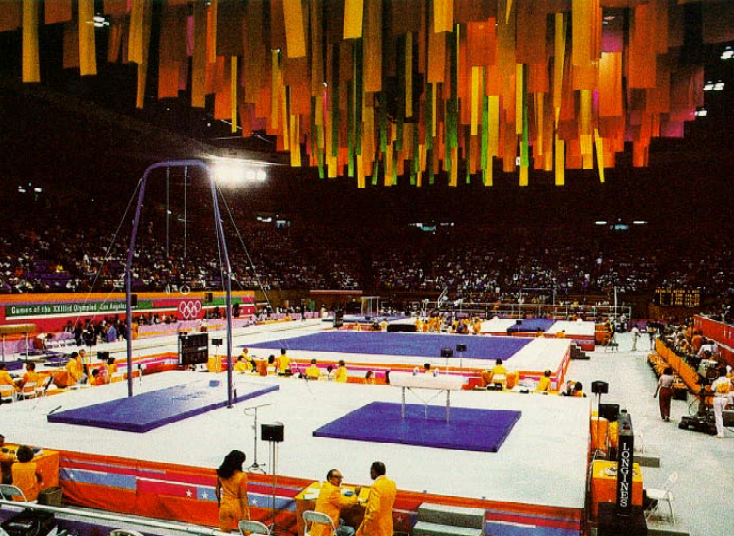 While perhaps not as exciting as, say, swimming, gymnastics, or track and field ... it was still awesome to have been able to attend an Olympic event. 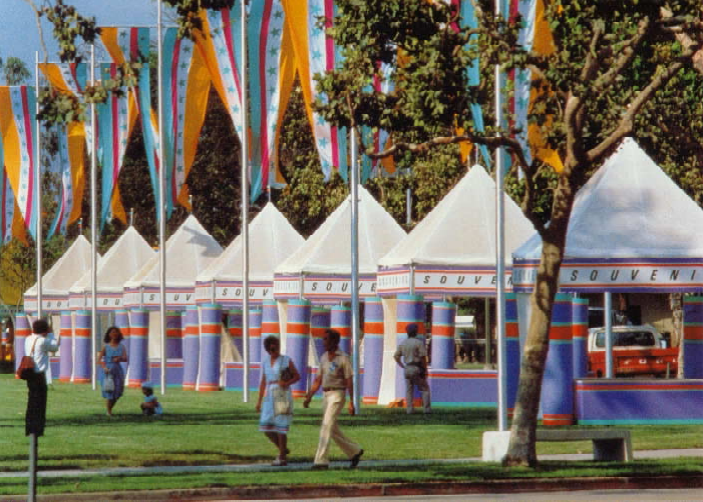 The Shine Auditorium on the far right is a good hint that this is the USC Olympic Village. Both USC and UCLA served as Olympic Villages. Here's an Olympic fact: Los Angeles made history as the first city ever to have an Olympic Village - back in 1932. Flagpoles and bright backdrop. Were there multiple award venues? Judging from the graphics, looks like the McDonald's Swim Stadium, at the University of Southern California (renamed to the Uytengsu Aquatics Center). 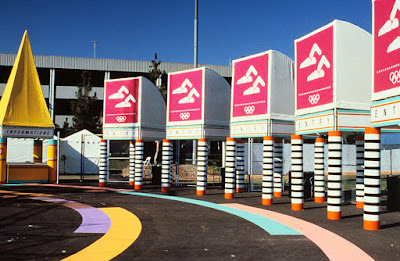 The McDonald's Swim Stadium was only one of the two venues constructed for the 1984 Summer Olympics. 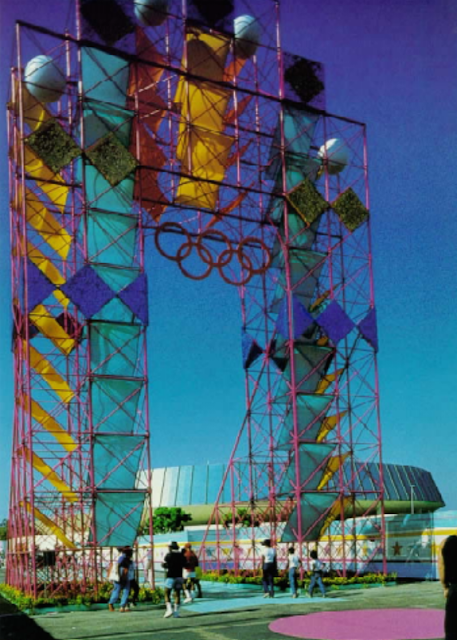 The other was the 7-Eleven Olympic Velodrome at Cal State Dominguez Hills, in Carson (16 miles south of downtown Los Angeles). 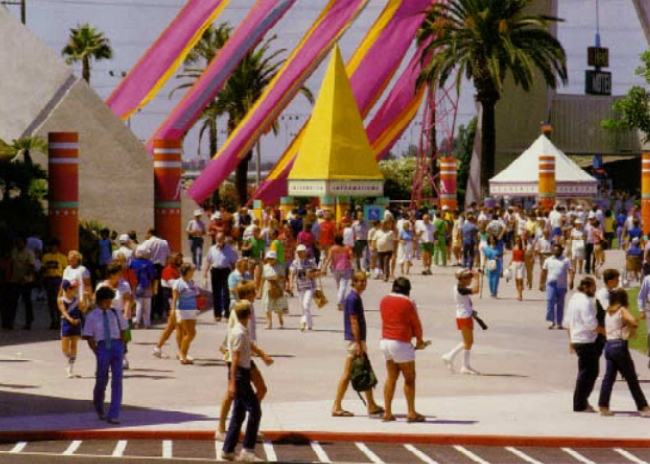 I loved the fact that the swim stadium was open air - taking advantage of one of Los Angeles' greatest assets: the weather. 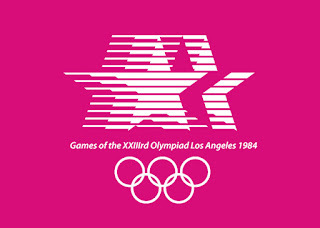 Hot pink: official logo of the 1984 Summer Olympic Games. The Olympic Tower at the Coliseum. 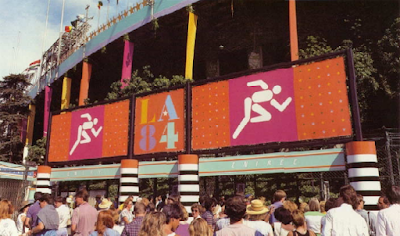 Here's a link to a 2014 article from Helene Elliott of the Los Angeles Times, looking back at the 30th anniversary of the 1984 Games. Closing out with a final photo: sunset at Lake Casitas. 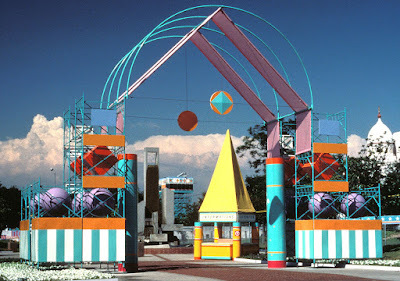 Feel free to leave a comment, suggest a correction, or share a memory from your experience there.